Shahrukh Khan and Kajol rang the opening bell at Nasdaq bright and early Monday morning. It was a huge deal because this is the first anyone from the Industry has been invited! 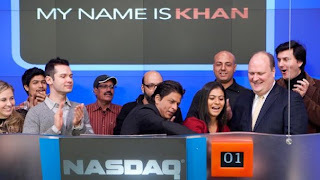 !Shahrukh Khan and Kajol rang the opening bell at Nasdaq bright and early Monday morning. It was a huge deal because this is the first anyone from the Industry has been invited! !